It has been suggested that List of most distant trans-Neptunian objects be merged into this article. (Discuss) Proposed since April 2019. These Solar System minor planets that were the farthest from the Sun as of December 2015 and/or March 2018. The objects have been categorized by their approximate heliocentric distance from the Sun, and not by the greatest calculated aphelion of their orbit. The list changes over time because the objects are moving. Some objects are inbound and some are outbound. It would be difficult to detect long-distance comets if it weren't for their comas, which become visible when heated by the Sun. Distances are measured in astronomical units (AU, Sun–Earth distances). The distances are not the minimum (perihelion) or the maximum (aphelion) that may be achieved by these objects in the future. This list does not include near-parabolic comets of which many are known to currently be more than 100 AU (15 billion km) from the Sun, but are too far away to currently be observed by telescope. In March 2018 several new Trans-Neptunian objects (TNOs) with a current heliocentric distance greater than 50 AU were announced by Scott S. Sheppard, Chad Trujillo, and David J. Tholen. Trans-Neptunian objects are typically announced publicly months or years after their discovery, so as to make sure the orbit is correct before announcing it. 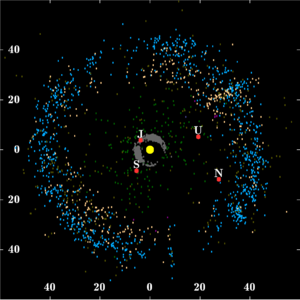 Due to their greater distance from the Sun and slow movement across the sky, trans-Neptunian objects with observation arcs less than several years often have poorly constrained orbits. Particularly distant objects discovered in 2018 may only be announced in 2020 or later. The discovery of an object known as V774104 was announced in November 2015 and was heralded by many news outlets as "the most distant Solar System object", surpassing Eris by close to 7 AU (not counting space probes and long-period comets). There is some confusion regarding its distance as of 2018, as V774104 might now be suspected of being closer than Eris, but this is due to a misunderstanding (which arose because Scott Sheppard was referring to an unannounced Sednoid). Another very distant body is Sedna, which was discovered in November 2003. Although it takes over 10,000 years to orbit, during the next 60 years it will slowly move closer to the Sun as it comes to perihelion. Pluto (30–49 AU, about 34 AU in 2015) was the first Kuiper belt object to be discovered and is the largest known plutoid (or ice dwarf). This observation of Halley's Comet in 2003 at 28 AU from the Sun illustrates some of the difficulty in observing objects as they grow more distant. The orbit of Sedna, shown in red, with the dot marking its current location. Inside are the orbits of the giant planets of the Solar System, and that of Pluto in purple. Sedna will travel out nearly 1000 AU, taking almost six millennia to do so. It is currently less than 100 AU from the Sun. ↑A crude estimate based on a short observation arc. ^ Beatty, Kelly (29 January 2018). "V774104 update". Retrieved 14 March 2018. ^ AU/yr indicates if the object is moving inwards or outwards in its orbit, and the rate at which it does so. Sedna has a negative value because it is approaching perihelion (closest point to the Sun) in 2076. (225088) 2007 OR10 is positive because it pased perihelion in 1857.